Hello all! Exciting things have been happening at The Taylor’s house. When I last left you, cabinets were being installed and prep for countertops was beginning. We’ve come along way since then. And I’m excited to show you all the work that’s been done. So here we go! Now that the cabinets are in, we can discuss the metalwork that will be going in some of the cabinet doors. I found a custom iron and wood worker through Etsy.com named Neal Smith. We came up with a design and he did beautiful work. 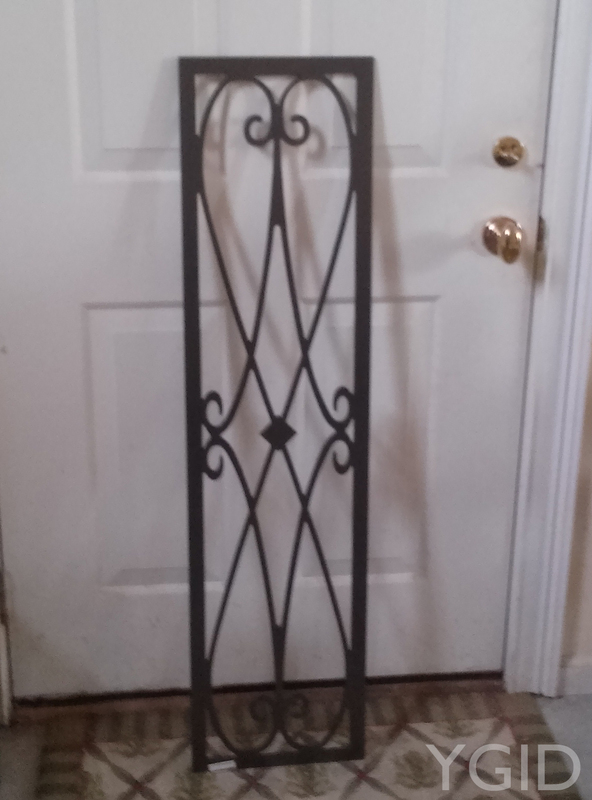 Please check out his sites should you be needing custom ironwork. Find his website here and his Etsy page here. Excuse the photo quality, I left my good camera back in 1985. Neal Smith does wonderful work. These grates will be going in the long cabinet doors with antiqued mirrored glass behind them. It’s going to look fantastic. 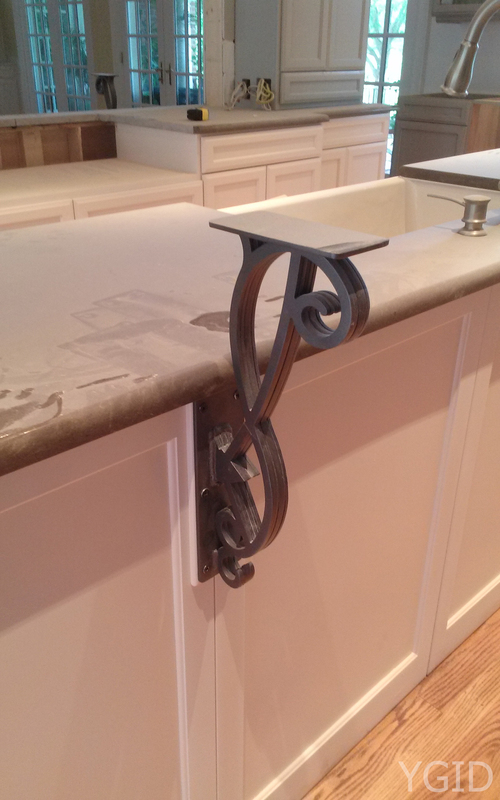 Along with these iron grates, Neal Smith created iron corbels to support the granite top to the island in the kitchen. 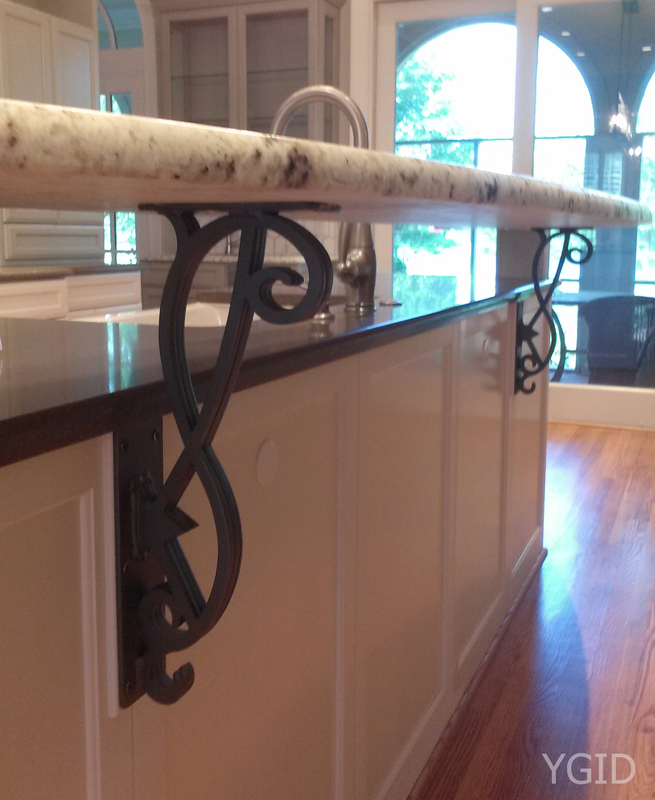 I designed the granite top to appear floating over the center island containing the sink. With the beautiful iron work, I feel we really achieved the vision I had in mind. 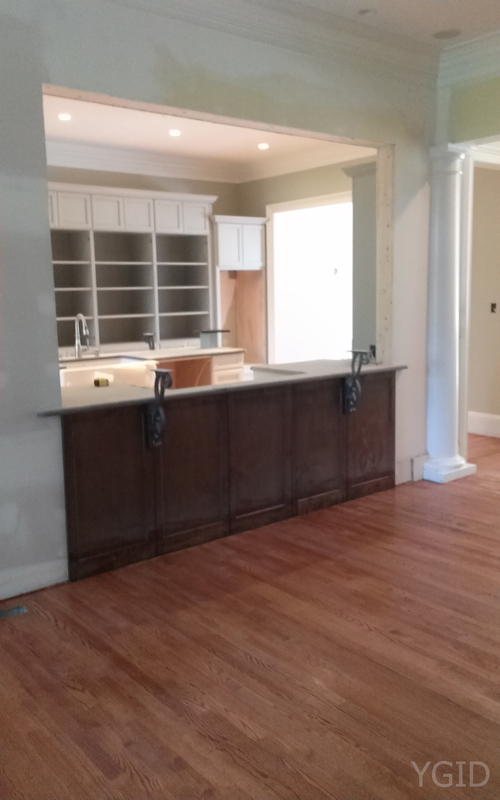 Also, as you can see countertops were installed. But I can’t give it all away at once though. You’ll have to be patient. Take note of the corbel in the background. View from the family room into the kitchen. Seated underneath will be bar stools. Here is a shot of the back wall of cabinets (the ones straight through in the picture above). 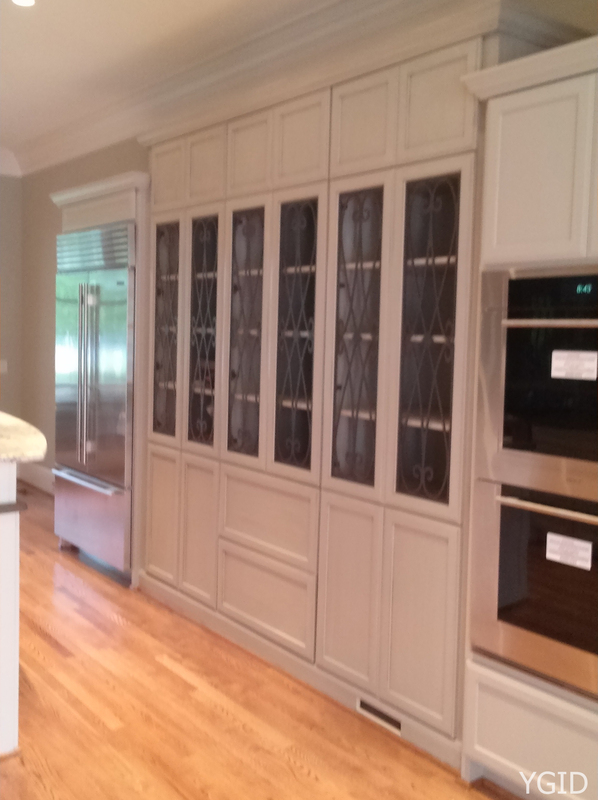 These are the cabinets receiving the iron grates and antiqued mirrored glass. Below is a picture of all of these installed, awaiting the glass. Excellent for storing dishes or small animals. 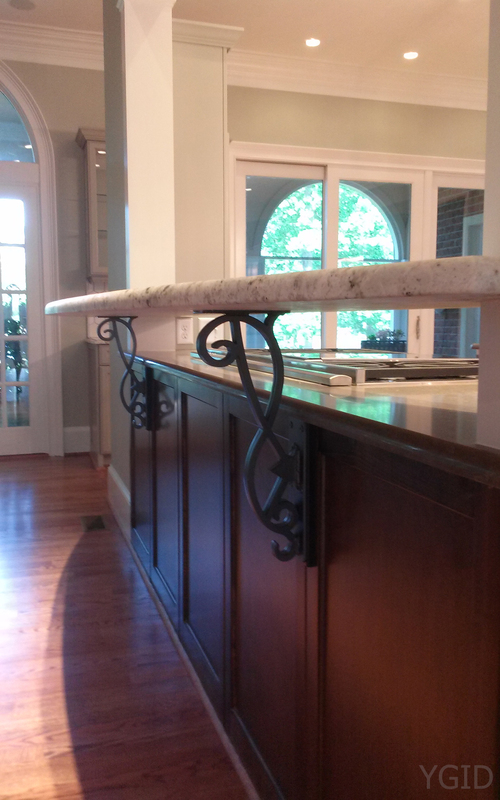 Moving along, we’ve got the floating granite bars installed. And they look amazing. That is a 12 foot, uninterrupted section of granite. One big piece. There’s a matching one on the center island as well. I’m just going to let the pictures do all the talking. I’m an angle-tease. Gotta save something for the big reveal. As you can see, we’re alllllmost there. So so close and it’s getting exciting. The homeowners are excited to get back into their kitchen whip up some tasty treats garnished with the envy of all their friends. Look for the final post coming up soon as, in actuality, the only thing left is the cleanup. So the the final post will have pictures from more angles that you could ever want or need.